I purchased three different zippers yesterday to test out with the sweater. There were no navy or midnight blue options to choose from, so I opted for a mustard yellow, gray, or black. I ended up going with the black since it matched the most closely. I sewed the sweater closed with a contrasting yarn and also sewed some bias tape along the edges of the sweater for a more finished edge. 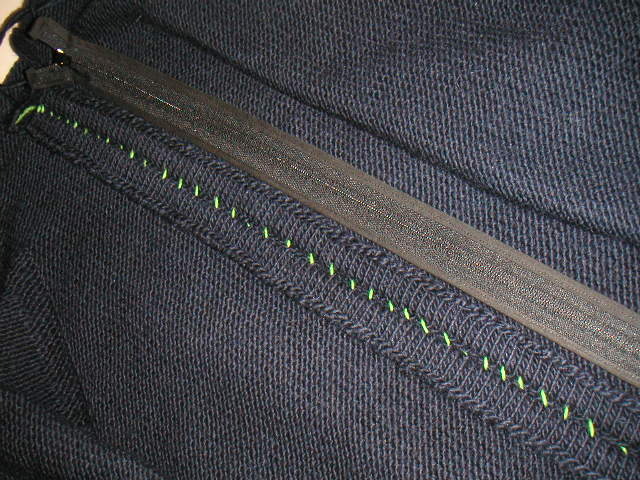 Next I'll mark the sweater and the zipper for placement and then baste it in place before handsewing with backstitching. Lastly, I'll sew down the collar facing. B will have a new sweater to wear this weekend! Photos to come! PS Zipper tutorials from ChicKnits and not martha were very helpful.